We are authorised distributer of GEHR Plastic Germany. Plastics produced by GEHR Plastics, one of the world's leading manufacturers of semi-finished thermoplastics stock shapes including rods, sheets and precision tubes. Description: Extruded, white and black in colour. We are ranked amongst the renowned organizations that are engaged in providing the best quality range of PP Square Rod. Our company is highly esteemed in providing Polypropylene Rod. 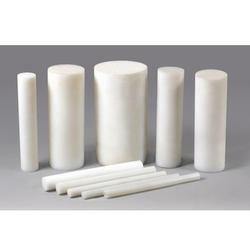 We are engaged in offering Polyethylene Rods. These rods are broadly finding their application in various applications. These rods are manufactured in adherence with international standards and norms using high-grade raw material. - As per the prodcut quality and customization, price varies from 145/- to 1000/- per Kilogram. Owing to our business expertise and years of experience, we are manufacturing PTFE / Nylon / Acetal / UHMWPE / Polypropylene Rods that are intricately designed by our qualified engineers and designers. Fabricated in conformation to the industry standards, these rods are widely appreciated for their durability, quality and flawlessness. POLESTAR™ HMHDPE rods exhibits a good combination of stiffness, toughness, mechanical damping ability with wear & abrasion resistance.